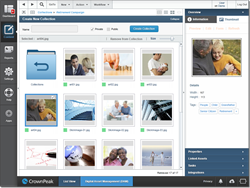 CrownPeak Technology, provider of the enterprise’s only open cloud platform for Web Experience Management, has released a new Digital Asset Management (DAM) offering, available now to its enterprise customers and digital agency partners. The company’s unique DAM service makes global management of digital media assets across all of an organization’s web properties quick and easy. ● Asset Curation. Organize and categorize digital assets at will, then easily police where they are deployed, regardless of the source content’s location. ● Standardized Editing. Normalize image editing functions across all global web properties, supporting collaboration and taming inefficient DAM workflows. ● Increased Control. Unify brand identity, image quality, asset versioning and compliance across the enterprise in one comprehensive cloud tool. CrownPeak’s DAM offering is able to openly access and manipulate digital media assets stored in a variety of third party marketing tools such as Box, Dropbox, Google Drive, Sharepoint and Veeva. Website teams tasked with creating better online customer experiences on a global basis can more easily enforce a unified, consistent brand look and feel – no matter where their digital assets are stored, even outside the web content management system. CrownPeak is positioned as a “Visionary” in 2014 Magic Quadrant for Web Content Management (WCM) by Gartner, Inc. As the only multi-tenant cloud CMS for the enterprise, CrownPeak empowers digital marketers with greater speed and control than hosted or on premise web content management systems. Privately-held, the company is on a rapid growth path with 100% revenue growth year-over-year as large global enterprises and leading agencies worldwide join its customer base. Access - CrownPeak DAM tracks and organizes digital assets across the enterprise with native platform integration to best-of-breed data and content sources where digital assets may be stored. It manages the seamless flow of image files, audio and video – independent of their location. CrownPeak is also compatible with third-party storage, enterprise content management and document management applications. Organization - CrownPeak DAM allows users to filter and classify digital assets by tagging attributes such as file type and meta-data tags (e.g. “product photos”) or by creating named collections (e.g. “Fall campaign”). Assets can be browsed, searched, moved and manipulated across the entire website portfolio from a single interface – eliminating asset redundancy. Collections allow web teams to provision special access in support of cross-team collaboration. Editing - CrownPeak DAM provides a unified, intuitive set of tools for image editing across all websites, efficiently eliminating unnecessary image rework. The Image Optimizer feature creates pre-packaged, optimized images for mobile, tablet or web with a few clicks. Finalized images can then be quickly and consistently published across all global websites. Any saved changes roll out automatically on production sites that use the image as well as to its original location. Previewing - CrownPeak DAM powers rich media preview of still image thumbnails and full web pages with adjustable sizing. Enforcement - CrownPeak DAM empowers brand owners to enforce compliance of digital assets with definitive or optimal quality standards, supported by layered security and rich team workflow built right into the CrownPeak platform. Collect and tag assets by expiration date or copyright, for example. CrownPeak can also integrate its capabilities with third-party digital rights management and governance monitoring tools. CrownPeak DAM is fully integrated with CrownPeak’s cloud content management platform and available immediately with the click of a button. The service is an optional offering that CrownPeak activates for customers and comes packaged as part of the Advanced Platform edition. The company will make pricing information available to interested parties. CrownPeak Technology provides the enterprise’s only open cloud platform for Web Experience Management. Since 2001, CrownPeak has pioneered the software-as-a-service delivery model for web content management systems. Digital marketers at large enterprises and leading agencies worldwide rely on CrownPeak to launch websites fast, affordably and without burdening I.T. CrownPeak’s WEM platform powers personalized digital experiences across thousands of global websites, optimized by native integration with more than 60 best-of-breed marketing data and content sources. Customers include AFLAC, AIG, Diageo, Eli Lilly, Kaiser Permanente, Men’s Wearhouse, MetLife, Prudential and Sony Music. For more information, visit http://www.CrownPeak.com.